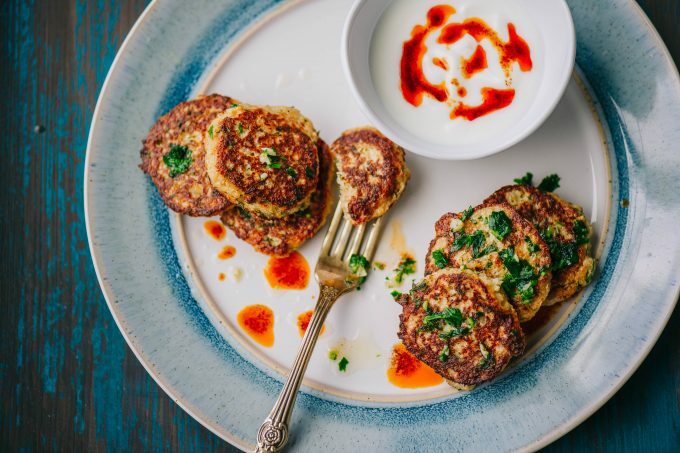 This recipe was born after the need of trying to use up the head of cauliflower I had in the refrigerator. Out of all of my children (it came out as if I have 8, lol), none of them eat cauliflower. I really have to try hard to sneak it into different foods. Here is the deal with cauliflower. It is not the type of vegetable you can actually hide into something. The taste is actually quite unique. It doesn’t go away anywhere when you use it for this recipe either. It just so happens that the rest of the ingredients in the list complement each other very well, creating a fantastic entree. 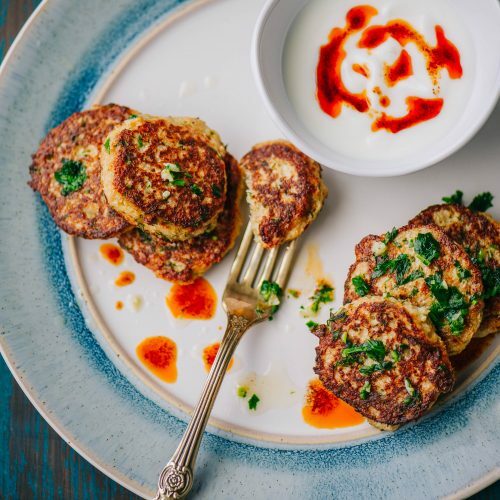 These cauliflower pancakes are gluten-free and very friendly when it comes to incorporating them into your daily food prep. If you wish to keep it that way, please keep on reading along. Technically boiling the cauliflower will work, too. You will just have to make sure that most of the moisture has evaporated before adding the rest of the ingredients. This would entail for you to actually wait until the moisture has evaporated and then adding the cheese, hoping the cheese will melt on time before the cauliflower patties fall apart. This way you will not have to add extra TBSP of clarified butter into it (although it does elevate these pancakes into another level). 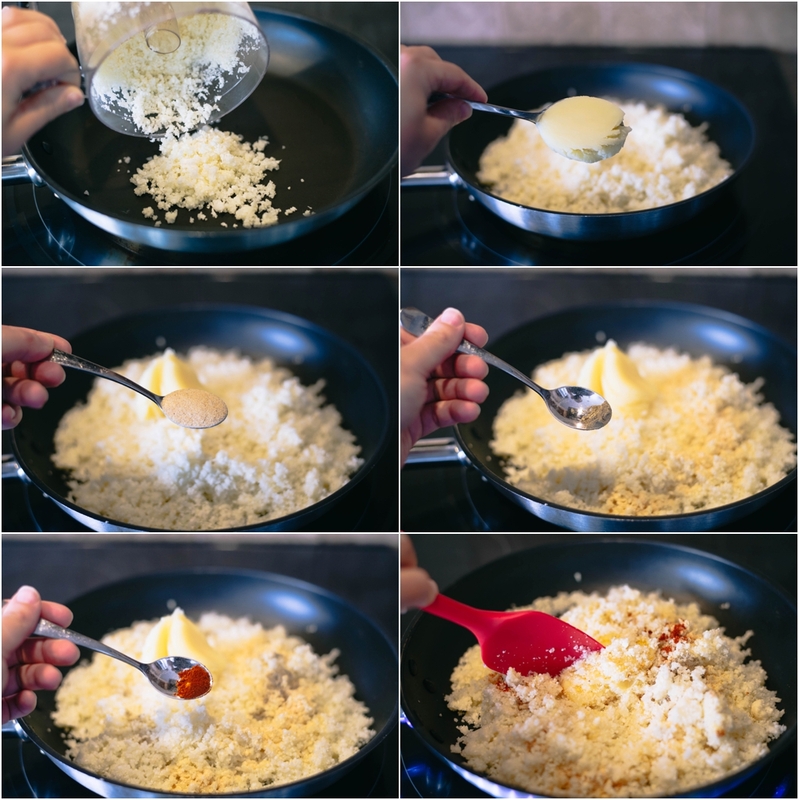 Sautéing cauliflower rice ensures that you get rid of most of the moisture before forming the patties and it would be the perfect technique to gently pre-melt the cheese in order to avoid adding additional gluten into the mix. The egg which we are going to add into the mixture should be just right in order to help the patties to keep their form, too. Either way, if you want to give it a try, let me know how it turns out. I would love to hear your thoughts on it. If you are using a head of medium cauliflower, we will need to cut it apart into florets or even smaller chunks. 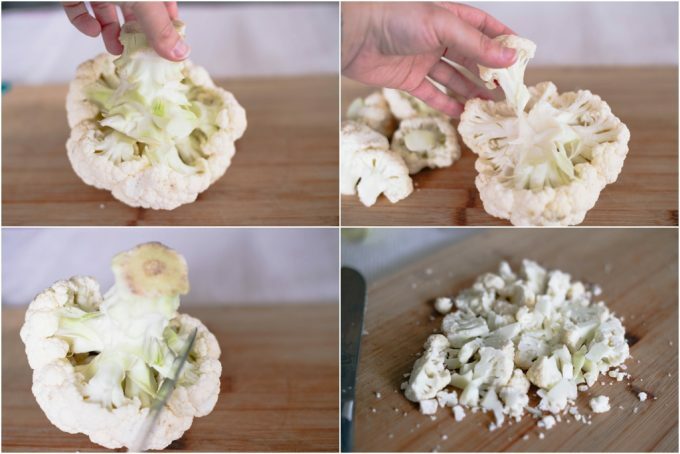 If you start cutting at the bottom of the stem and remove it, cauliflower florets will actually come apart easily and neatly. 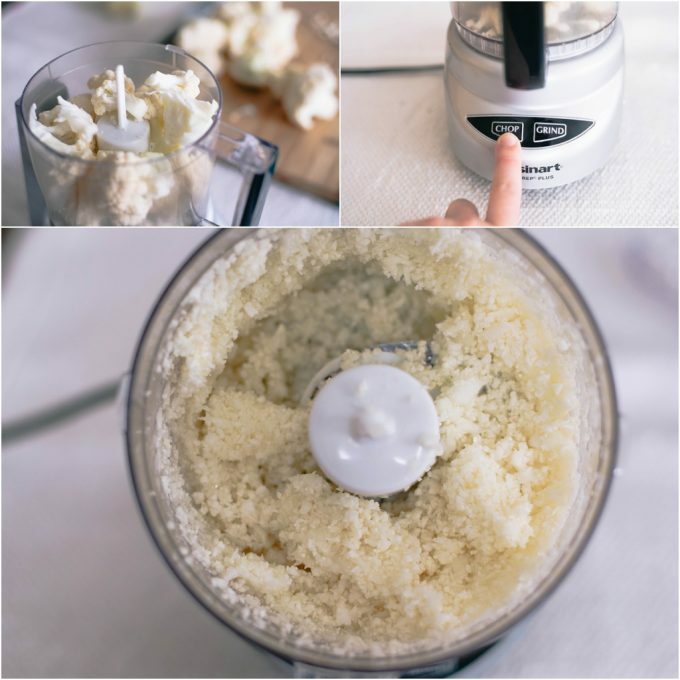 Cut the cauliflower into florets and slice them into smaller pieces, just so your food processor can handle them. Place the cauliflower pieces into the food processor and chop them up, creating cauliflower rice. Saute the cauliflower rice for about 8 minutes or until it feels like the rice have half cooked and most of the moisture have evaporated from it. During this process, the rice might change color and turn slightly yellowish brownish. This is totally fine. However, if you feel like the rice is burning, please turn the heat down a notch. Once the desired doneness has been reached, turn off the rice and add 1/2 cup of cheese. Quickly stir the rice along with the cheese, until the cheese has melted slightly. 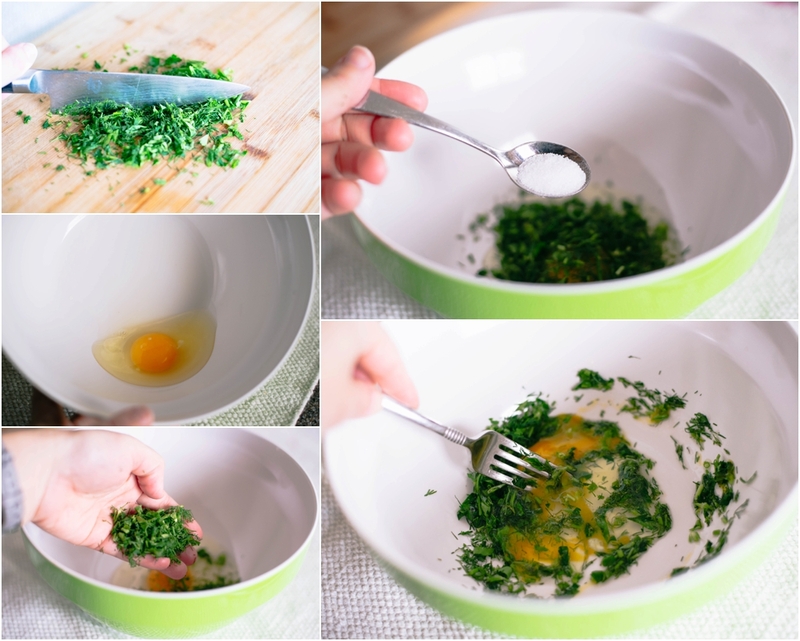 In a medium bowl mix, 1 egg with the herbs of your choice (I chose to mix a little parsley and dill) add salt and mix everything well. Add sauteed cauliflower rice into the herb mixture and give it a nice stir, making sure everything is well incorporated. The mixture is NOT going to be a hard one. It could be slightly runny. But not too much. You should still be able to work it into a shape with a small cookie scooper. Heat up a medium skillet on medium heat and add the olive oil. Scoop out one portion of the pancakes with a small cookie scooper or just use a tablespoon to portion out what you need. Place the pancakes in the skillet and ever so gently press on them to create a pancake shape. Once on side of the pancakes turn golden brown flip them on the other side. Have a plate with a paper towel ready to catch all the extra oil from under the ready pancakes. Voila! Your pancakes are ready. If you wish to make the yogurt dip, please do so. 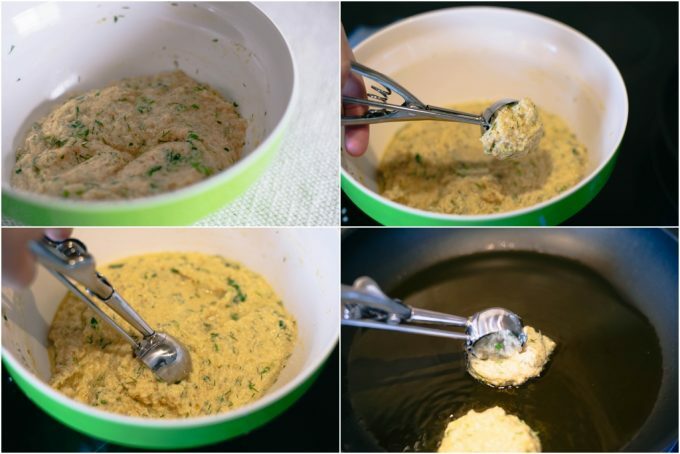 My children really enjoy these cauliflower pancakes with this dip. I heat up the olive oil a little and add the smoked paprika. Turn the heat off. In a small bowl, I mix yogurt with a little amount of garlic. Pour a little bit of the paprika oil mixture onto the yogurt and serve with the pancakes. Enjoy! Voila! Your pancakes are ready. If you wish to make the yogurt dip, please do so. 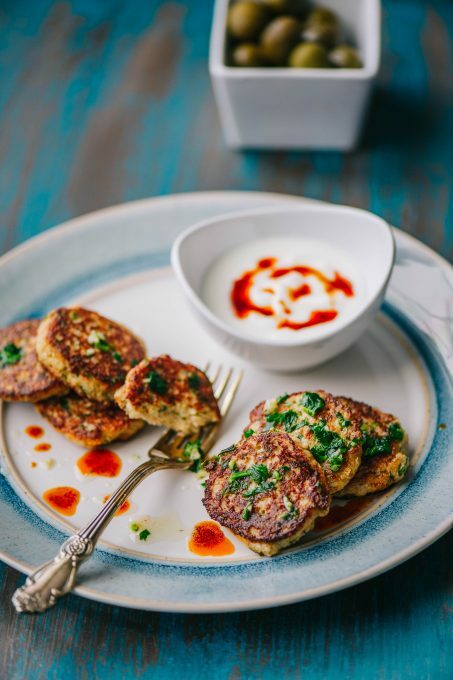 My children really enjoy these cauliflower pancakes with this dip. I heat up the olive oil a little and add the smoked paprika. Turn the heat off. In a small bowl, I mix yogurt with a little amount of garlic. Pour a little bit of the paprika oil mixture onto the yogurt and serve with the pancakes.